"See the unpolished pearls. Work closely with authors who have good ideas that may not be well-developed and help them refine their prose." Nancy S Redeker, PhD, RN, FAHA, FAAN, is the Editor of Heart & Lung: the Journal of Acute and Critical Care, a position she has held since 2011. She served as Associate Editor from 2009-2011. Dr. Redeker is the inaugural Beatrice Renfield Term Professor in Nursing at Yale School of Nursing – Yale University, where she serves as the Director of the Biobehavioral Laboratory and the Yale Center for Sleep Disturbance in Acute and Chronic Conditions. Her primary research emphases are improved understanding of the role of sleep and sleep disorders and the development of sleep promoting interventions for people with – or at risk of – heart disease. Dr. Redeker, a Fellow of the American Heart Association and theAmerican Academy of Nursing, has extensive experience teaching and mentoring. 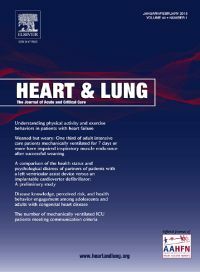 Heart & Lung: The Journal of Acute and Critical Care presents original, peer-reviewed articles on techniques, advances, investigations, and observations related to the care of patients with acute and critical illness and patients with chronic cardiac or pulmonary disorders. It is the official journal of AAHFN (the American Association of Heart Failure Nurses). Because health care and the health sciences are global and interdisciplinary, authors are encouraged to submit manuscripts that reflect these perspectives. The one-year Impact Factor is 1.320 and the five-year Impact Factor is 1.585. Heart & Lung publishes around 25 percent of submitted manuscripts and it is published bi-monthly. Traditional and open access options for publication are available. A. As the Editor of Heart & Lung, it is my privilege to contribute to the advancement of significant science and innovative clinical practice related to the aims and scope of our journal. In collaboration with our distinguished Editorial Board and Publisher, it is very exciting to shepherd the journal’s evolution to an interdisciplinary focus. I take particular pleasure in fostering the publication skills of new authors and investigators who have wonderful ideas but sometimes need significant support to present them in a publishable form. Q. What are your biggest challenges as editor of Heart & Lung? How do you overcome these challenges and what extra support can Elsevier provide? A. I am committed to obtaining and utilizing the knowledge and skills of our excellent panel of reviewers to ensure high quality, innovative content and rapid time to publication. Given the intense time commitments of many of our reviewers, our major challenge is obtaining a sufficient number of reviews in a timely fashion. I am fortunate to have the service of an excellent editorial assistant, Ardis O’Meara, who assists me in communicating with the reviewers. Our Publisher, Mercedes Simoncelli, and the Elsevier web portal and production team have also been instrumental in addressing these goals. A. My answer to question 2 pertains to this concern. I can’t imagine that peer review will not be used in the future. However, I think we can use it more effectively. Authors who have successfully published in our journals should be expected to contribute to peer review. We have all benefitted from the expertise of others, so this “giving back” should be an expected part of the author/scientist role. Our journal prints a list of reviewers annually to recognize their contributions, but we need to think about better ways of showing our appreciation for reviewers’ work, perhaps through other types of rewards. Elsevier’s Article Transfer Service may also reduce some of the pressure on peer review by avoiding the need to repeat reviews. A. As a consumer of scientific information, my behavior clearly reflects this trend, which likely affects the visibility of all of our journals. However, as a scientist and author, I am always conscious of the reputation and credibility of the journal articles, including the places in which they were published. I expect that the most credible journals will continue to be cited. A. Open access may be positive when it achieves its goal of making high quality information available at no cost to the public, addressing a significant disparity between those consumers who have, and do not have, access to high quality libraries with extensive holdings. However, the ways of covering the costs of publication are not sufficiently developed in this model. Although the costs of subscribing to journals may decrease for libraries, these costs are now the responsibility of the authors or their departments. For those without external funding for their publications, these costs are often prohibitive. If open access is to continue, universities and other organizations must re-organize the ways in which the costs of publications are covered. The proliferation of “predatory” open access publishing is also a major concern, and many potential authors and editorial board members are naïve to these problems, which must be addressed to make open access successful. A. The Impact Factor is important, but it is not the only consideration. There is a need for other metrics, but I have no experience with them. A. As an author, investigator and faculty member, it is very difficult to keep abreast of the many changes in the fields in which I have an interest. Features that promote my ability to rapidly identify the most significant developments and assist me to synthesize and integrate research findings would be most helpful. A. I have used social medical and online professional networking to recruit participants to a survey. These methods were very helpful in helping to acquire a large sample of respondents. Although I know that many editors use these tools in their editing roles, this is very time consuming, and I have not used them in my editing work – a “part time” position. It might be helpful to have assistance with these functions in order to promote the journal, in addition to the more traditional components of my role. A. Our journal is becoming increasingly interdisciplinary, a trend that is consistent with trends in health professional education and “team” science. I hope that this continues in the future. Our journal and others are now mostly read online. I expect that in the future the paper format will no longer exist. Identify and select the best quality reviewers possible and rely heavily on their expertise. See the unpolished pearls. Work closely with authors who have good ideas that may not be well-developed and help them refine their prose. Look for new trends in the field and solicit papers that stimulate ideas about these trends.